"I am a monk," he said, as he sat in the parlors of La Salette Academy, (On January 21, 1894.) which is his home while in Memphis, "and not a priest. When at home I travel from place to place, teaching the people of the villages and towns through which I pass. I am dependent upon them for my sustenance, as I am not allowed to touch money." "I was born," he continued, in answer to a question, "in Bengal and become a monk and a celibate from choice. At my birth my father had a horoscope taken of my life, but would never tell me what it was. Some years ago when I visited my home, my father having died, I came across the chart among some papers in my mother's possession and saw from it that I was destined to become a wanderer on the face of the earth." There was a touch of pathos in the speaker's voice and a murmur of sympathy ran around the group of listeners. Kananda (American reporters generally spelt his name as Vive Kananda in those days.) knocked the ashes from his cigar and was silent for a space. "If your religion is all that you claim it is, if it is the only true faith, how is it that your people are not more advanced in civilisation than we are? Why has it not elevated them among the nations of the world?" "Because that is not the sphere of any religion," replied the Hindu gravely. "My people are the most moral in the world, or quite as much as any other race. They are more considerate of their fellow man's rights, and even those of dumb animals, but they are not materialists. No religion has ever advanced the thought or inspiration of a nation or people. In fact, no great achievement has ever been attained in the history of the world that religion has not retarded. Your boasted Christianity has not proven an exception in this respect. Your Darwins, your Mills, your Humes, have never received the endorsement of your prelates. Why, then, criticise my religion on this account?" "I would not give a fig for a faith that does not tend to elevate mankind's lot on earth as well as his spiritual condition," said one of the group, 'and therein I am not prepared to admit the correctness of your statements. Christianity has founded colleges, hospitals and raised the degenerate. It has elevated the downcast and helped its followers to live." "You are right there to a certain extent," replied the monk calmly, "and yet it is not shown that these things are directly the result of your Christianity. There are many causes operating in the West to produce these results. "Religious thought should be directed to developing man's spiritual side. Science, art, learning and metaphysical research all have their proper functions in life, but if you seek to blend them, you destroy their individual characteristics until, in time, you eliminate the spiritual, for instance, from the religious altogether. You Americans worship what? The dollar. In the mad rush for gold, you forget the spiritual until you have become a nation of materialists. Even your preachers and churches are tainted with the all-pervading desire. Show me one in the history of your people, who has led the spiritual lives that those whom I can name at home have done. Where are those who, when death comes, could say, 'O Brother Death, I welcome thee.' Your religion helps you to build Ferris wheels and Eiffel towers, but does it aid you in the development of your inner lives?" The monk spoke earnestly, and his voice, rich and well modulated, came through the dusk that pervaded the apartment, half-sadly, half-accusingly. There was something of the weird in the comments of this stranger from a land whose history dates back 6,000 years upon the civilisation of the Nineteenth Century America. "But, in pursuing the spiritual, you lost sight of the demands of the present," said some one. "Your doctrine does not help men to live." "It helps them to die," was the answer. "We are sure of the present." "You are sure of nothing." "The aim of the ideal religion should be to help one to live and to prepare one to die at the same time." "Exactly," said the Hindu, quickly, "and it is that which we are seeking to attain. I believe that the Hindu faith has developed the spiritual in its devotees at the expense of the material, and I think that in the Western world the contrary is true. By uniting the materialism of the West with the spiritualism of the East I believe much can be accomplished. It may be that in the attempt the Hindu faith will lose much of its individuality." "Would not the entire social system of India have to be revolutionised to do what you hope to do?" "Yet, probably, still the religion would remain unimpaired." The conversation here turned upon the form of worship of the Hindus, and Kananda gave some interesting information on this subject. There are agnostics and atheists in India as well as elsewhere. "Realisation" is the one thing essential in the lives of the followers of Brahma. Faith is not necessary. 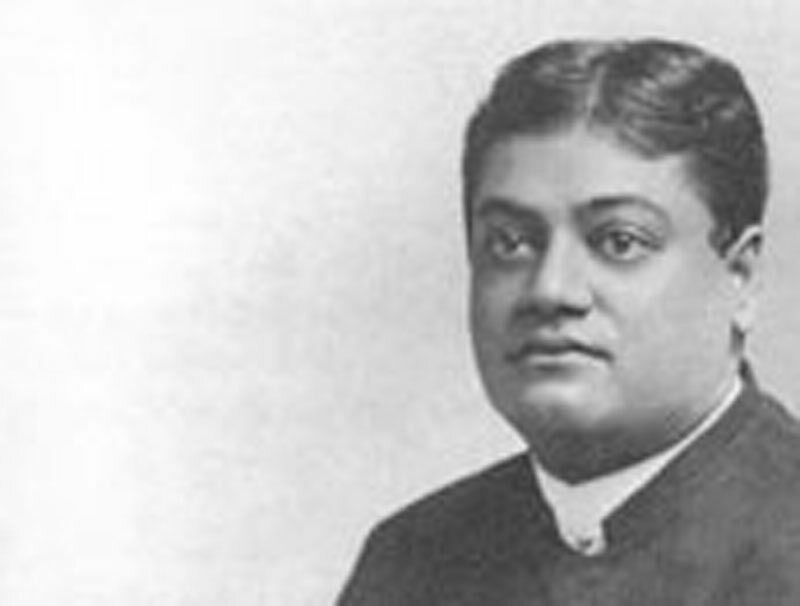 Theosophy is a subject with which Kananda is not versed, nor is it a part of his creed unless he chooses to make it so. It is more of a separate study. Kananda never met Mme. Blavatsky, but has met Col. Olcott of the American Theosophical Society. He is also acquainted with Annie Besant. Speaking of the "fakirs" of India, the famous jugglers or musicians [magicians? ], whose feats have made for them a world-wide reputation, Kananda told of a few episodes that had come within his observation and which almost surpass belief. "Five months ago," he said, when questioned on this subject, "or just one month before I left India to come to this country, I happened in company in a caravan or party of 25 to sojourn for a space in a city in the interior. While there we learned of the marvellous work of one of these itinerant magicians and had him brought before us. He told us he would produce for us any article we desired. We stripped him, at his request, until he was quite naked and placed him in the corner of the room. I threw my travelling blanket about him and then we called upon him to do as he had promised. He asked what we should like, and I asked for a bunch of California [?] grapes, and straightway the fellow brought them forth from under his blanket. Oranges and other fruits were produced, and finally great dishes of steaming rice." Continuing, the monk said he believed in the existence of a "sixth sense" and in telepathy. He offered no explanation of the feats of the fakirs, merely saying that they were very wonderful. The subject of idols came up and the monk said that idols formed a part of his religion insomuch as the symbol is concerned. "What do you worship?" said the monk, "What is your idea of God?" "The spirit," said a lady quietly. "What is the spirit? Do you Protestants worship the words of the Bible or something beyond? We worship the God through the idol." "That is, you attain the subjective through the objective," said a gentleman who had listened attentively to the words of the stranger. "Yes, that is it," said the monk, gratefully. Vive Kananda discussed further in the same strain until the call terminated as the hour for the Hindu's lecture approached.